Wasp Nest Removal in Fife ? Call 07591 035288 Today! Fife pest control are local and reliable fast response service specialising in wasp control / wasp nest removal in Fife and all surrounding areas. Our wasp nest removal team offer a complete solution to all your wasp problems. We will successfully eradicate all wasps and if required can remove old nests, if accessible. 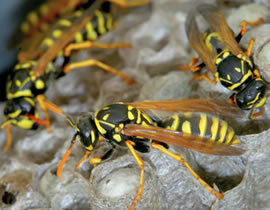 To dispose of wasps you do not need to 'remove the nest' but you need to treat the nest and wasps within. This is carried out by using a special powder (only available to professionals) which is injected into and around the entrance to the nest. The powder will then kill all the wasps in the nest and the ones returning within a couple of hours or so. On our visit our qualified operative will need to know the location of the wasps entrance to the nest to carry out the treatment. You can usually see this where the wasps are most active - under the eaves of the house , near an air grate or in the garden near fence or shed etc. Please note that we are normally unable to treat wasp nest above two storeys due to health and safety & insurance. Reaper Pest Control have a 24 hour emergency call out service covering the Fife area including Cowdenbeath, Edinburgh, Kinross, Kirkcaldy, Dunfermline, St Andrews, Cupar, throughout Fife and also the West Lothian area. Call 07591 035288 for details of our wasp nest solutions and 7 Day / 24 hour call out service.